NADA Chairman Wes Lutz says bold predictions are often flawed. DETROIT — "Question the hype." That's Wes Lutz's advice on prognostications of how primary transportation models will change. People will no longer buy personal vehicles. Autonomous vehicles will eliminate traffic fatalities. Dealers will have to be dragged into the electric vehicle revolution. "Each one of these narratives might sound right. 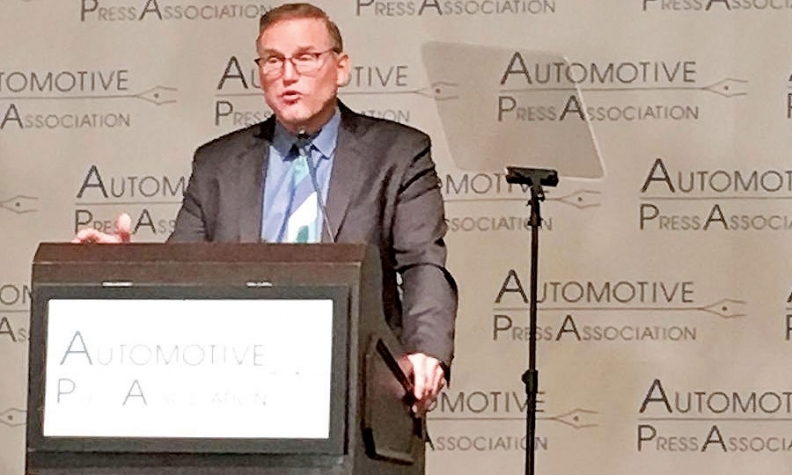 But the truth is that each one is built on false or unproven pretenses," Lutz said at an Automotive Press Association luncheon here last week. "And these narratives are put out there by stakeholders that have an obvious incentive for them to be true — even if they aren't." Consumers will continue to own vehicles and use ride-hailing services when it makes sense, he said. The cost of using ride-hailing services as a primary mode of transportation, $20,118, was at least twice the cost of owning a new midsize sedan in 20 of the largest metro areas in the U.S., Lutz said, referencing a study by the AAA Foundation for Traffic Safety. Lutz's second point: There's not enough data to know whether self-driving cars are truly safer. "On the surface, the notion that self-driving vehicles will ultimately be safer than vehicles today certainly feels true," he said. "But that argument is built on the premise that humans are lousy drivers." With the technology in vehicles today, such as automatic braking and lane assist, people are becoming better drivers, he said. For years, Lutz said, he has heard that one of the primary reasons electric vehicles aren't selling more is that dealers don't want to sell them. "I want to sell anything my customers want to buy — period. It could be powered by turtles. I don't care," he said. EVs are more expensive than vehicles with internal combustion engines, have a lower residual value and can't be refueled as easily or quickly. Plus, gasoline is cheap right now. Lutz said he would sell EVs, but consumer demand is missing.